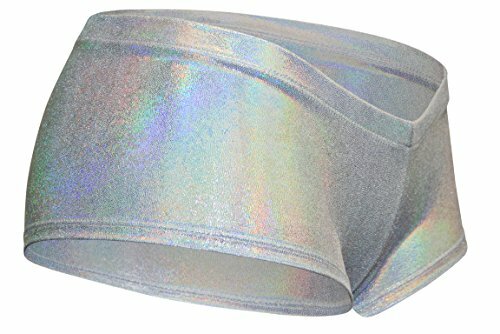 These Hot White and Silver Holographic Booty Shorts are Made From the Highest Quality Spandex! They are Super Smooth and Reflect Like The Colors in a Pearl!! They are Low Rise and Cheeky. Super Comfortable and Stretchy! •ADULT PETITE (XS): Waist- 24"-26" Hips- 34"-36"
•ADULT SMALL: Waist- 26"-28" Hips- 36"-38"
•ADULT MEDIUM: Waist- 28"-30" Hips- 38"-40"
•ADULT LARGE: Waist- 30"-32" Hips- 40"-42"
•ADULT X-LARGE: Waist- 32"-34" Hips- 42"-44"
•ADULT 2X: Waist- 34"-36" Hips- 44"-46"
•ADULT 3X: Waist- 38"-40" Hips- 46"-48"
•ADULT 4X: Waist- 42"-44" Hips- 48"-50"
•ADULT 5X: Waist- 46"-48" Hips- 52"-54"
•CHILD XS (4): Waist- 19"-21" Hips- 22"-23"
•CHILD SMALL (5-6): Waist- 21"-23" Hips- 24"-25"
•CHILD INT (6X-7): Waist- 23"-24" Hips- 26"-27"
•CHILD MED (8-10): Waist- 24"-25" Hips- 28"-29"
Dilly Duds Merchandise is Handmade in the USA. These super hot booty shorts are low rise and cheeky! Made from a gleaming, super reflective white and silver holographic spandex. You will love the colors that burst out when the light hits this fabric! Fantastic for EDM, EDC, Pole Dancers, Rave Goers, Festival Clothes, Exotic Lingerie... You Name It... These Are Perfect For Any Occasion!! PLEASE USE DILLY DUDS SIZING CHART FOUND IN PICTURES AND BELOW IN DESCRIPTION. If you have any questions about this product by Dilly Duds, contact us by completing and submitting the form below. If you are looking for a specif part number, please include it with your message.